This Presentation date is April 6, 2018 at 14:30-16:30 local time. David Noy, VP, Product Management, introduces the delegates to the company, quickly reviewing the company’s legacy in IT. He then begins to discuss the company’s move to cloud solutions. 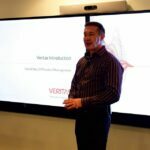 David Noy, VP, Product Management, reviews the Veritas software-defined storage offerings, which spans across block, file, and object storage offerings. He shows how the addition of data lake and orchestration capabilities allow for Veritas to offer compelling cloud-based storage solutions. David Noy, VP, Product Management looks at the Veritas 360 Data Management portfolio, that offers a comprehensive set of data services for customers. This is based around the core principals of data discovery, classification, and policy automation. These portfolio of products all interact with each other to provide a comprehensive data protection and management solution. Amit Sinha, Director, Product Management, overviews CloudPoint, a cloud-native data protection solution. This protects workloads running in the cloud, allows you to manage snapshots in the cloud and data center, while offering visibility from a single interface. Ryan Lefevre, Lead Architect CloudPoint, demonstrates CloudPoint, their cloud-native data protection solution. He reviews the interface, basic configuration, and other capabilities.